2 Westgate Barn01263 715779work01603 870304fax Self-cateringBuilt from traditional brick and flint, this characterful 17th Century barn offers modern day living and is a great base for a north Norfolk holiday. Spacious and comfortable with bedrooms on both the ground and first floor, this is a great holiday home for all the family to enjoy. The pretty summer house in the walled garden is a lovely play space for younger members of the family and this sunny spot also has a patio area and barbeque. The well-equipped and large kitchen is the perfect spot for some experimental cooking and the living room with a warming woodburner is a comfortable room to relax in at the end of the day. 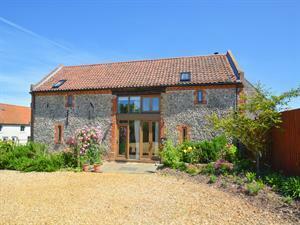 The barn is located on a quiet lane on the outskirts of the village where there are beautiful views to absorb. The north Norfolk coastline is within easy reach and a great place to explore if you are walkers, birdwatchers, beach lovers, sailors, golfers and more. A great deal of the area is set within an Area of Outstanding Natural Beauty and the quaint villages that hug this part of the coastline, such as Wells-next-the-Sea, Stiffkey, Blakeney are a delight to explore. Norfolk's food heritage is also well provided for in this part of the county with numerous award winning pubs, restaurants, farm shops and cafes to discover, not forgetting, of course, the traditional fish and chips by the sea. History is on the doorstep too with the fabulous Holkham Hall, Houghton Hall and the Queen's estate at Sandringham. General: Oil fired central heating. Underfloor heating to the ground floor. Woodburner with starter pack. Other: Towels. Books and games provided. Travel cot, Highchair, Stairgate. Welcome Tray. Built from traditional brick and flint, this characterful 17th Century barn offers modern day living and is a great base for a north Norfolk holiday. Spacious and comfortable with bedrooms on both the ground and first floor, this is a great holiday home for all the family to enjoy. The pretty summer house in the walled garden is a lovely play space for younger members of the family and this sunny spot also has a patio area and barbeque. The well-equipped and large kitchen is the perfect spot for some experimental cooking and the living room with a warming woodburner is a comfortable room to relax in at the end of the day.